Sara of ArtsAfire specializes in professional acrylic paintings for the average home buyer. With a wide range of prices and a few different styles, ArtsAfire sets out to appeal to more than one type of clientele. Most of the artworks are done on gallery profile stretched canvas so they come ready-to-hang without any added costs. A very limited number of the smaller pieces are done on canvas board and require framing--but those are standard sizes so it's still easy to get a frame for them. I've been making art since I was 13, when I started by drawing Dragonball Z characters. Yes, I was so cool. I was going through a really hard time because we had just moved to a very small, very close-knit town in Minnesota where I absolutely did not fit in (simply because I was not born there), and drawing became a form of escape for me. Before then, I'd never picked up a pencil to do a drawing. I couldn't draw stick figures so I figured I couldn't draw anything. Turns out I was wrong. My shading and pencil techniques really evolved during that time and I eventually graduated to pen and ink and then acrylic painting, which is by far my favorite medium right now (next to Intaglio, but since I'm no longer in college I no longer have access to the print shop and my apartment is simply too small right now to have my own press). My grandfather has been a painter his entire life and I've always wanted to be like him (you can see his shop at artbyjay.etsy.com--I manage his shop for him). We have very different styles, but I definitely got my artistic talent from him. I still can't draw stick figures. I thoroughly enjoy colors. As a result, most of my abstract pieces have no subject matter. Or, if you prefer, the subject matter is color. Of course, my drawings and my more realistic paintings will have a subject matter, but color is an important aspect of each of my pieces. In fact, color is so important to me that I get giddy over complimentary colors. For instance, I have a bright yellow coat and a purple suede clutch from Morelle on Etsy. Makes me happy every morning. I also eat my M&Ms in complimentary colors, which means I either skip eating the yellow and brown M&Ms or I give them away. I don't know why those M&M people chose brown over purple. But this insane love/giddiness for color is often a focal point in my work. It's probably going to cause a scandal that my favorite thing to do is not painting and working on my shop. While I love that and hope to make it my life's work, my favorite thing to do in the whole wide world is go to Barnes & Noble with a favorite book (If Andy Warhol Had a Girlfriend by Alison Pace, any of the Harry Potter books, or, if I'm in a sappy romantic mood, a Linda Howard book (shhh...at least there isn't a half naked pirate on the front of her books) or one of the Twilight series books), buy a chocolate almond biscotti, perhaps a bagel with cream cheese, and a Godiva hot chocolate. Then I sit there and I read all day long. Keeping a steady in-flow of new artworks is a big challenge for me over the last couple of months. I have so many ideas in my head and I just haven't had the time to sit down and paint. I work as a marketing manager full-time, and there are just some nights where all I can do is make dinner for my husband and I, clean the house a little, and crash. But I've recently made a 3 month meal plan to make dinner a "no-brainer," a life list to check activities off of that I need/want to get done each week, and a commitment to spend at least 2 hours on the creative aspect of ArtsAfire each night. So things are definitely picking up and I'll have all sorts of new lines of art and even some greeting cards (incorporating mini original paintings) in the very near future. My very favorite piece right now is my Color Theory piece. I have more of these sets in the works, some including texture, some including different color tones/shades. They're a very neutral (despite being colorful) way to incorporate artwork into a room. 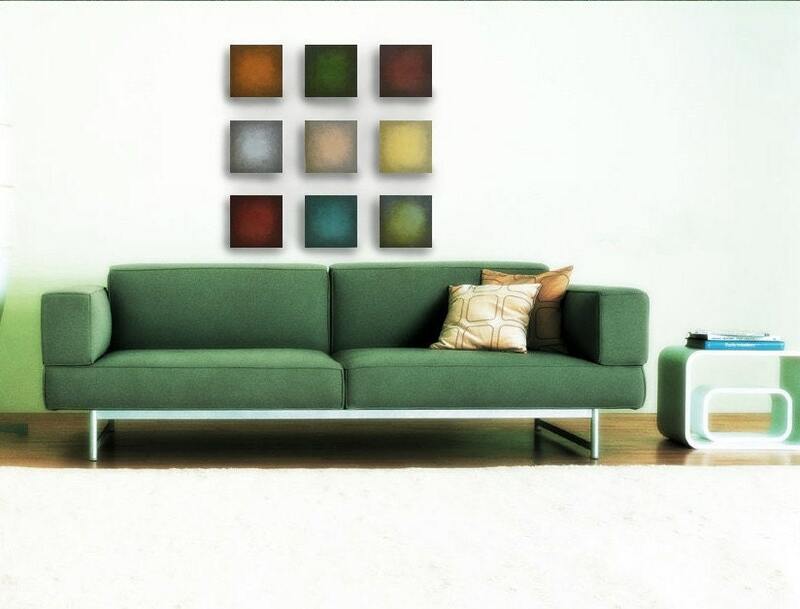 I've found that these sets go with just about any room, any style, any color. So it's a safe "home decor" gift and it's my favorite, so I'd definitely love to receive it as a gift. An FBI Profiler. I really wanted to catch serial killers like Samantha on the Profiler TV series. When I was younger than that, I really wanted to be a beef jerky taste tester though I kind of knew that wasn't feasible. Morelle - I'd take one of her purses over a designer purse any day. I own two so far. Molecular Muse - I dropped my science major in college in favor of art, but her jewelry kind of makes me wish I knew all the stuff she does. I have a pair of her serotonin earrings and I love them. Messicakes - Her art is so colorful and vibrant that it completely appeals to my senses and makes me absolutely happy when I look at it. Phipps Art - His t-shirts are so original and some of the best I've found on Etsy. He's also local to me! Metalicious - Her jewelry is gorgeous. I love her metal "diamonds." NakedDecor - Love their clocks and their dog art prints. Hopefully within a year or two I can quit working full time and focus more on my Etsy shop. I'd love to be able to rely on painting for a living. I don't think I'd mind getting up early if I was getting up early to do something that I had completely, fully chosen to do with my life. I love my current job but painting is the ultimate dream. Visit ArtsAfire at Etsy or at artsafire.blogspot.com. While you're there be sure to sign up for the newsletter. Sara gives away a free painting every month to one of her newsletter subscribers!